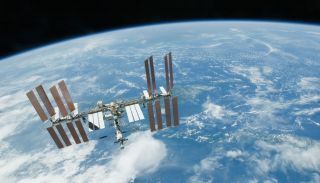 The International Space Station has been continuously occupied by rotating astronaut crews since November 2000. Russia's Soyuz MS-09 crew spacecraft is is shown docked to the International Space Station (ISS). The MS-09 carried NASA astronaut Serena M. Auñón-Chancellor, the European Space Agency's Alexander Gerst and cosmonaut Sergey Prokopyev to the ISS in June 2018.